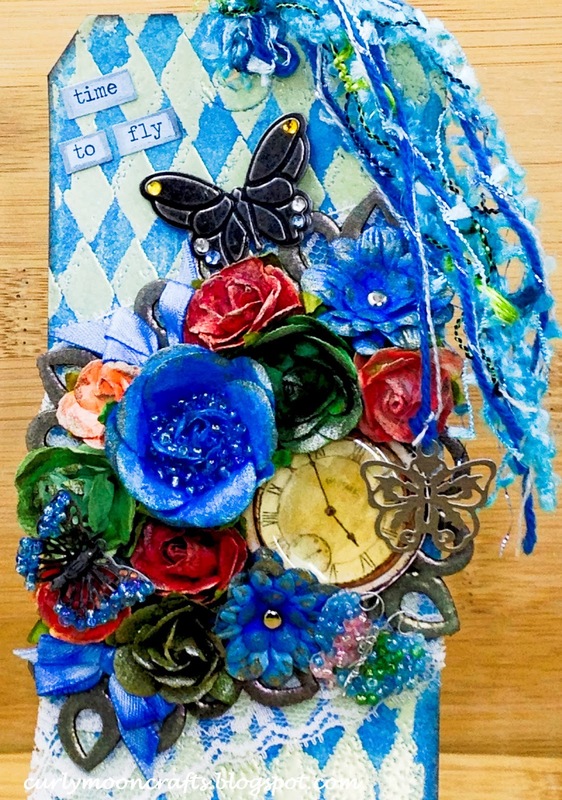 Hi Friends: Today's post is a tag called Time to Fly - it uses my favorite LSG sprays, Magicals and embossing powders. I hope you like the tag and that you will look below for the process, challenges, and supplies. Have a super day! I started with a manila tag and used the Tim Holtz Harlequin stencil with Versamark ink to create my base layer. I sprinkled it with LSG embossing powders in Madonna Robe Blue Gold and heat set it with my heat gun. I also used the Madonna Robe Blue Gold and Stardust Candy Rose powders with Versamark ink on the chipboard. I colored my flowers with a combination of the LSG sprays and magicals, then tipped them with some gold from the Heirloom Gold Perfect Pearls Mist. I layered some lace over the tag, then arranged the flowers with the chipboard which I cut into leafy shapes. I added the clock face and the top butterfly charm. I glued some seed beads to the edges of the Prima butterfly and glued it to the top of the flowers. The tiny butterfly under the clock face started as a plain metal butterfly - I added the seed beads then shaped the butterfly antennae and body from silver wire and added it to the center. The center blue flower looked a little base, so I added some blue seed beads to the center. For the sentiment, I used some Chit Chat stickers colored with the LSG sprays and edged with my Stabilo ALL pencil. I colored a bit of white ribbon with the LSG spray, then tucked them into the flowers at the top and bottom. I edged the tag with Black Soot Distress Ink and finished off with some lovely fibers from my stash, then I dangled 1 last butterfly charm from the fibers. This was so much fun to create - I love using the LSG products.